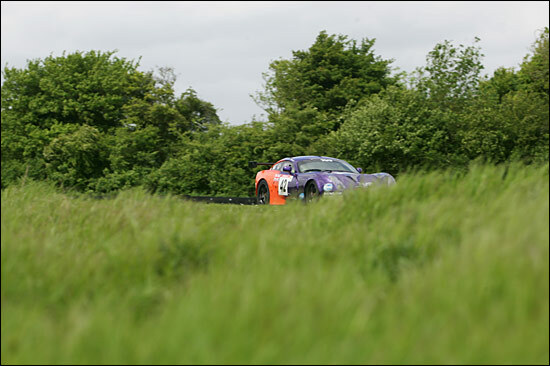 Thruxton followed straight on from the team’s fraught Scottish weekend at Knockhill, so Team LNT had done performed wonders to have two healthy TVRs running on Saturday morning in Hampshire. Andrew Thompson was standing in for team owner Lawrence Tomlinson again, partnering Jonny Kane, and with the usual Pat Pearce and Warren Hughes in #43, the driver line-up looked as strong as ever. 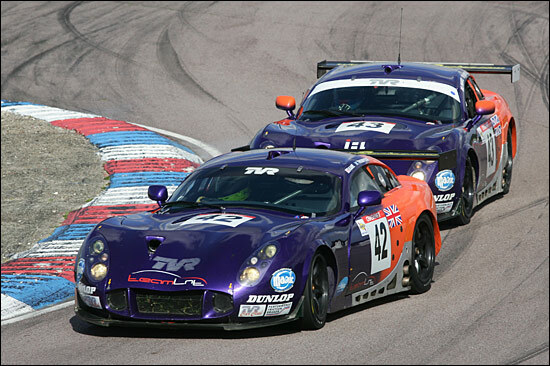 The rivals were the usual ones, but with the addition of two Moslers, from Eclipse and Cadena GTC. Neither of these teams had raced in Scotland. Despite ‘only’ having time to build up two fresh engines for Thruxton (no spare), the team was out to attack from the word go. That resulted in third and fifth fastest times in free practice, split by one of the American Moslers, the Eclipse example, Phil Keen at the wheel. This young man would be in and among the TVRs for much of the weekend. 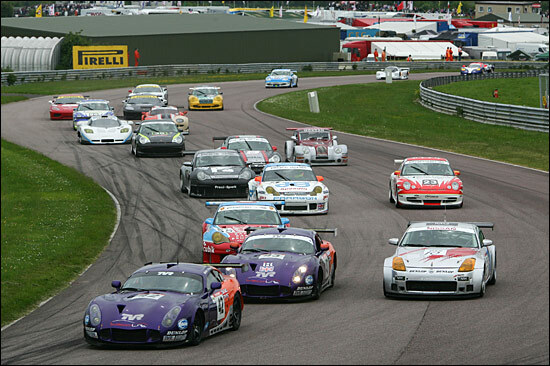 The Ferraris were fastest though, the Italian machines perfectly suited to the fast sweeps of Thruxton. The pattern of Saturday morning was more or less repeated in qualifying. 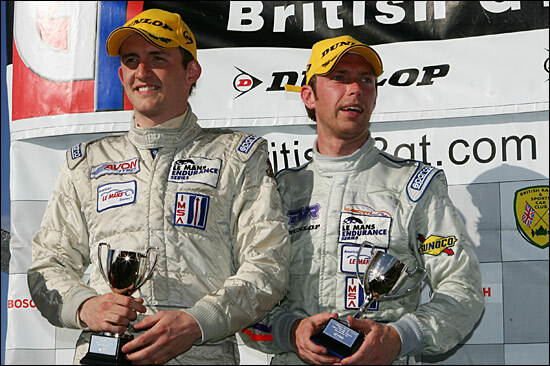 Andrew Thompson set the second fastest time, but he was eight tenths slower than fellow Scot Nathan Kinch in the championship-leading Scuderia Ecosse Ferrari. 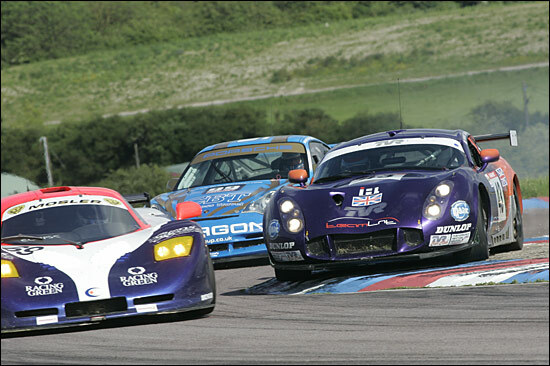 Gavan Kershaw was third quickest in the other Mosler, with Pat Pearce a very close fourth in #43 TVR. In second qualifying, Jonny Kane and Warren Hughes – as fast as anybody, in anything – were just over and just under two seconds off the pace of Kirkaldy and Mullen in the Ferraris. This was going to be tough – but dramatic. It was Thompson and Pearce to start the first race, late on Saturday afternoon. Both were out to try and match Nathan Kinch in the #35 Ferrari: it helped their cause that the #34 Ferrari didn’t start the race. 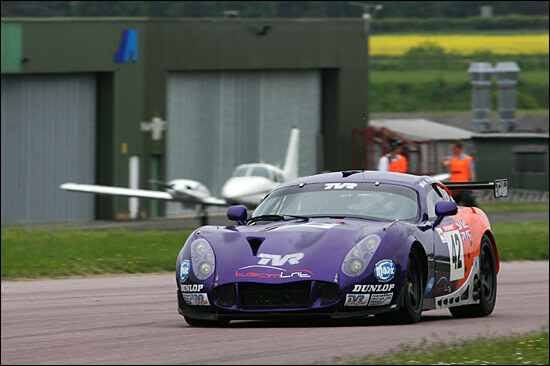 The two TVRs had an incident-packed opening lap or two, Neil Cunningham coming off second best round the back of the circuit to one of them, and with Gavan Kershaw in one Mosler having handling troubles, second and fourth on the grid translated into an early second and third. The Scot in the Ferrari spun under braking completing lap 7, and as the TVRs crossed the line at the end of that lap, the order changed – and the T400Rs were 1-2! This wasn’t in the (Ferrari) script. But Phil Keen in the Eclipse Mosler was on the move, already up to third (from seventh on the grid) – then taking second from Andrew Thompson, under braking at the chicane, completing lap 8. Pat Pearce held off the Mosler for a couple of laps, but had to concede the lead on lap 10. 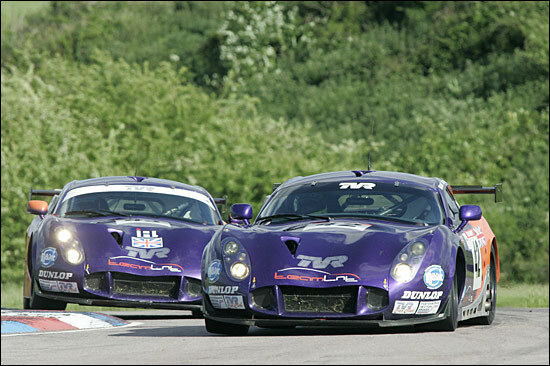 At least the TVRs were ahead of that Scuderia Ecosse Ferrari though (which was fourth) – and the British cars were the most spectacular ones on the track. The Safety car was called out next, to retrieve two or three cars abandoned out on the circuit. The TVRs pitted while the field was going slowly, but as a precaution, the Andrew Thompson car had a tyre change, while the Pat Pearce one didn’t. All the teams were taking a long, hard look at tyres during the 45 second, compulsory pit stops. The #35 Ferrari exited the pit lane with two places gained, and Andrew Kirkaldy only had Warren Hughes ahead of him, in the #43 LNT TVR. This was going to be interesting…..
“I wasn’t going to make it easy for Andrew to pass,” said the assertive Warren Hughes – and he didn’t. But after several laps of absolutely clean, but very close, racing, the Ferrari did ease by in the Complex – but Warren hung on superbly. Only at the very end did the gap grow to anything substantial, both drivers looking after their rubber, and aware of the fact that punctures were affecting several other cars. 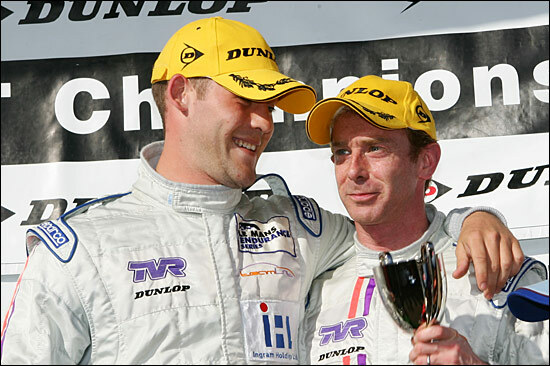 Jonny Kane was battling back after his tyre change, and his task was to take third from the Nissan 350Z, which he managed in good time before the chequered flag fell. He’d well and truly seen off the surviving, points-scoring Mosler, the Eclipse version. The Ferrari advantage really became apparent in the opening phase of Sunday’s race. Warren Hughes was running a very strong third, but losing out to the tune of a second and a half per lap to the Mullen- and Kirkaldy-driven Ferraris. Jonny Kane was in trouble early on, a clash with the Embassy Porsche sending him to the pits with a puncture. He and Andrew Thompson battled back to … what should have been second place… but wasn’t. The next dramas that took place though afflicted the sister car – which retired with a unique problem. Two Porsches had clashed on the circuit, and one had shed a chunk of wheel rim. 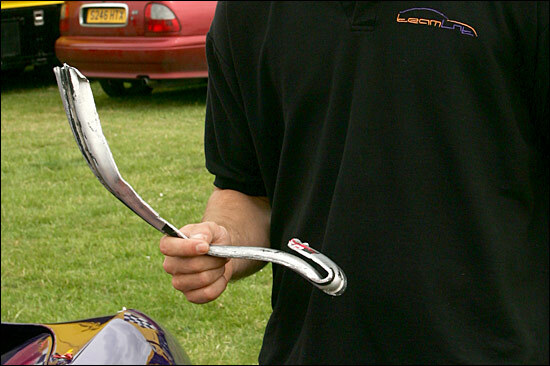 Warren Hughes was unlucky enough to come across it lying on the track, and the right front wheel threw the offending object at the engine bay, where it pierced the brake master cylinder! Warren Hughes limped in with fluid pouring from the wrecked component, race over. When will that ever happen again in GT racing? Pat Pearce surveys the damage. And this is the offending piece of Porsche hardware. Meanwhile, Kane and Thompson had fought back to second place, helped by a long pit delay to one of the Ferraris. The other was completely out of sight, but second place would have made Andrew Thompson’s weekend just about perfect. Except that he incurred a very late puncture. He tried to manage the final stages of the race so that he didn’t have to complete another lap, but lack of grip meant that he slithered over the start-finish line and had to complete a 47th tour. The two Moslers had ‘got him’ by then anyway, but a deserved second became a crawling round fourth. So the two Thruxton races produced a second, a third, a fourth and a bizarre retirement - not a bad weekend’s work for the team, especially after such a busy schedule of races recently. Now there’s a slight pause, until Castle Combe at the end of June. Time for some development work on the TVRs.